Here's a little easy quiz to brighten up the wet dingy evenings for you all. Take a look at the photos of the off - road shared use cycle path and pavement that leads into the Imperial Park shopping centre in Hartcliffe. Can you spot what isn't meant to be there?. First prize is a week touring the Middle East with David Cameron flogging weapons. Even more so if you send them to Public schools, of course. State schools, however, can also prove costly. Here's the scene just after the 2011 Ski trip to Austria arrived back at Redland Green School (we know this, we asked). A trip that must have cost over £1000 per pupil when spending money is added to the bill. Ouch. Imagine the added insult, therefore, when you walk out of the school grounds having picked up your child to find Bristol's finest traffic wardens have chosen just this moment to visit Redland and ticket any car blocking a dropped kerb (not a yellow line in sight). One of Bristol Traffic's many roving reporters managed to get this photo of the ticketing in action, whilst the wailing of the Redland Mum's affected by the outrage could be heard across the neighbourhood. Less off-piste, more piste-off. So now, for at least two families, that'll be £1040 minimum. For a ski trip. Shocking. We see that the "Turning Bristol Red" blog is using one of our photographs of Jon Rogers. Not just embedding, but putting a complete new copy up on their own server: http://turningbristolred.files.wordpress.com/2011/01/p1030249.jpg. That was a photograph staged as part of the ongoing treegate story. Yes, like Top Gear, sometimes things are rigged. It was Chris Hutt's funeral, Jon was one of the people who stood up said nice things about Chris: it was a year today that we were all down at the Zetland Road junction, where Chris presented Jon with the second place in the Antibicycle awards. It's bit of a shame, therefore, that what was a deliberately staged photograph at Chris's funeral has become, well politicised. This doesn't mean there's anything wrong with the text, it's worth a read and the audience can come to their own conclusions, only that the Bristol Traffic team doesn't like making enemies, as it interferes with our strategic plans. We sometimes see Jon in the street, he stops and says hello. And last week one of our reporters bumped into Paul Smith over in Portishead, where Paul was polite, despite the fairly muddy condition of the reporter. If someone we know and respect -such as the Bristol Blogger- had wanted the pic, we'd have said "yes, go for it", but we're not so bemused by someone using it who hasn't yet done anything to help us, and without even asking. This site doesn't make any declaration of how our pictures can be re-used. There's an implicit declaration of copyright there -that it is retained by the original photographers. If people want to use our photographs elsewhere, it is not merely polite to ask, it is a requirement -something that someone trained in law should realise. We are pleased that our work has ended up being used in the campaign leaflets of the Labour, Green and LD parties over the past few years -everyone who asked got the response "yes". But they asked, they didn't just take. This is particularly ironic given one of the last acts of the labour government was the Digital Economy Bill, which has some pretty awful provisions on copyright in the internet era, as record and DVD companies don't understand about how networks work, and would rather we all sat at home paying a premium to consume whatever Sky TV beams to us, with the little TV box then uploading statistics on what we watched. Not, say uploading our own photographs or videos to youtube, to become our own media reporters, whether it's on traffic issues in the city centre or -far better and braver- filming the overthrow of dictatorships from your mobile phones as you stand up to rulers that have declared a state of emergency for forty years. It's also amusing given the experience of Crap Walking and Cycling in Waltham Forest, who had some of their artwork used by their Local Labour party; quite a story [1, 2, 3, 4, 5], though we suspect Freewheeler would be happier if they actually addressed some of the issues that the photographs raise. Darren, you can re-use the four photos on this posting. That's two of you, one of Gary Hopkins and one of the Eastville ward results where Glenn Vowles is not that far behind the conservatives. But not the current Jon pic you are using, and if you want any of our others, email us first. Next time we're at an election we'll try and get some less blurred ones of you. We hear Charlie Bolton will be standing again, and he shared his chips with us. Nobody else did that. One amusing consequence of the RPZ is that as the fine for parking without a resident permit in the "permitted parking" area is the as for parking on double yellow lines, if you aren't resident, you may as well park where it is most convenient to you. Nice, though S826TAW could have pulled forward a bit more. We would have. To help cyclists get to this oasis, Avon Home Carers of fishponds have graciously parked both cars WU10LLV and WU60MHN up on the pavement, so creating a wider road for the cyclists. We hope the tax dodgers are grateful, for, as the logo says "we care"
What with the 20 mph zone and all, some people may think that Monty no longer welcomes vans. First, we are pleased to show the first ever double parking event recorded in Montpelier. We didn't know it was technically possible, but with the BMW in the yellow line area and the van FH02EKZ up on the pavement, we have reclaimed Picton Street! Round the corner, Picton Square. Can you see that? A missing bollard. Finally it can be used again for short stay parking, instead of a wasteland for pedestrians. Today HY08UOK is celebrating this shared space. Meanwhile, over in Montpelier St Werbughs, the council van RF58NRZ is showing others how to park on a corner with double yellow lines. The chosen parking option allows for excellent visibility and does not hinder the progress of other large vehicles. Thank you for your posting on our entry Traffic Calming by YK06USX. I work with a company that sells bollards and we would LOVE to get a link to their site from Bristol Traffic. Especially as these inventions feature on your blog quite often, such as your History of Bollards Is this something you're open to? If you could let me know either way that would be much appreciated. While you were posting your two comments, you would have had time to notice the text immediately above which stated "No adverts, no spam, no requests for cross linking. We will only be rude.". As this text warned, we not only decline your request, we do so publicly, with your email address put up online with the email address converted into an Internet Engineering Task Force RFC2822-compatible form, RFC2822 replacing, as you may recall, RFC822, so ensuring that spam-bots will find your address and get in touch with your inbox, giving you opportunities to buy discounted counterfeit pharmaceuticals as well as Nigerian 419-spam about how this-week's toppled middle-eastern leader's bank funds could be yours for a small investment up front. Now, perhaps our rules were not clear enough, so we have reviewed the text and the IETF RFC2119 standards on the correct use of MUST, MUST NOT, SHALL, SHOULD, SHALL NOT, SHOULD NOT, MAY and MAY NOT. Commenters MUST NOT post spam, MUST NOT post requests for cross linking and MUST NOT post up requests for paid links. Such attempts SHALL result in one or more postings in which we MAY be rude or we MAY make fun of you and MAY include your public email address. Furthermore, we MAY report you to google for attempts at paid linking, who SHALL then punish your site. This statement follows RFC2119 rules regarding the use of MUST, MUST NOT, MAY, and SHALL and MUST be treated as normative. We hope that this clarifies things, and that you do not attempt to add any more comments, as if you continue to do so we SHALL go to the relevant google form and report you and your customer. Thank you for your participation in the Bristol Traffic Project. We are keeping an eye one some newly proclaimed subversives, the People's Cycling Front of South Gloucestershire, whose goal is for S Gloucs to have cycle paths that the Dutch won't laugh at. They have denounced the new cycle paths of the Tailspin housing estate between Lockleaze and the MoD as something the Dutch will laugh at, which apparently they did. Well, let's drive out and see, as we were worried that this estate may be encouraging alternative transport instead of the joys of the A4174 ring road of a weekday evening. Next to the sign advertising a new way of live in a Brand new Urban Village, we see a photo of a family all cycling without helmets on the path beside the estate. There are no houses in the photo as it was taken "before". There is some text in the advert about how wonderful it will be, but the ageing VW Polo hides it. Nearby, it has that Urban Village flavour -maybe even a taste of Montpelier- as a VW Golf parks up on the pavement, some student cycles by, and the 20 mph roadsign has been twisted to one side by a passing truck. Round the corner, as the subversives noted, yes, there is a new cycling path which is about 40 cm higher than the old one. What has changed since last week's denunciation is the give way signs for traffic crossing this cycle path have been removed. Nothing to fear here then. Business as usual. 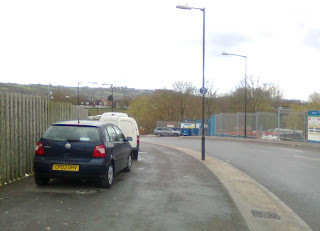 No happy families will be using these paths to get to the city, or even as far as crashing into the bollards by the MoD. We hear the Cycling Front are planning a kind of competition one lunch time next week to see who can ride the path, mountain bikes with or without suspension recommended. Keep an eye on their @cyclingfront twitter feed for news. This little mini convertible, YK06USX, has managed to make the most of the tiny area allocated to parking here, by almost, but not quite fitting in to the gap, so resorting to a bit of echelon-parking. The result is nice bit of traffic calming, not just because it creates a pinch point, but because approaching traffic can't be sure that the mini isn't actually pulling out without bothering to indicate. This reduces traffic speeds on Zetland Road. From a distance, the nature of the park-out can be observed. It adds a pinch point to a pinch point. Given the risk to this vehicle's paintwork, such selfless dedication to road safety must be congratulated. Freemantle Square, the council is happily making us pay even more for the right to park near the inner city, and ticketing those who resist! Fortunately, just down the hill, the zone ends, and on Springfield road, you can double park provided you stay far enough away from the yellow lines as to not infringe them. From the (sadly) militant pressure group of people to poor to afford cars comes this news: the government plans to give councils the power to restrict paveparking to occasions other than when mothers with kids are blocked. We don't need to say anything other than repeat the quote this commenter on the Sun's article, who knows it is safer to park on the pavement than inconvenience fellow drivers. i'd rather force a mother into the road, where she can stop, look, listen and navigate carefully than park my car obstructively in the road. See that? The government makes us pay to drive, and they make us pay when we park too. Meanwhile, here in Bristol, the Evening Post is horrified to discover that Bristol comes in the top ten cities in Britain for parking charges. We are not shocked as we know something else: Bristol comes in the top ten cities for Britain, and has a far higher percentage of motor vehicle commuters than central London. There may be some correlation there. It's been a few weeks since the RPZ rolled out, a year since Chris Hutt last commented on it. Time start looking at the impact of the RPZ on the city. The RPZ has devastated Woodland Road and the rest of the university quarter. With some of the staff having parking in the (former) front gardens of the buildings, these roads used to be a lovely commuter spot, just before the pay to park area. Students got up too late to get look in. But now, well, completely empty at 08:30. That not only makes it bad for commuters, it makes it a more pleasant place to walk and cycle. At least on those days when some Big Society volunteers act as community lollipop people. The sign of cyclists just makes things more painful, as we know that not only do they not pay to be in traffic jams, they don't have to pay to park. Fortunately, we managed to get our white van to the BRI-managed "shared space" area that is Southwell Street, which had a little bit of pavement left for us. 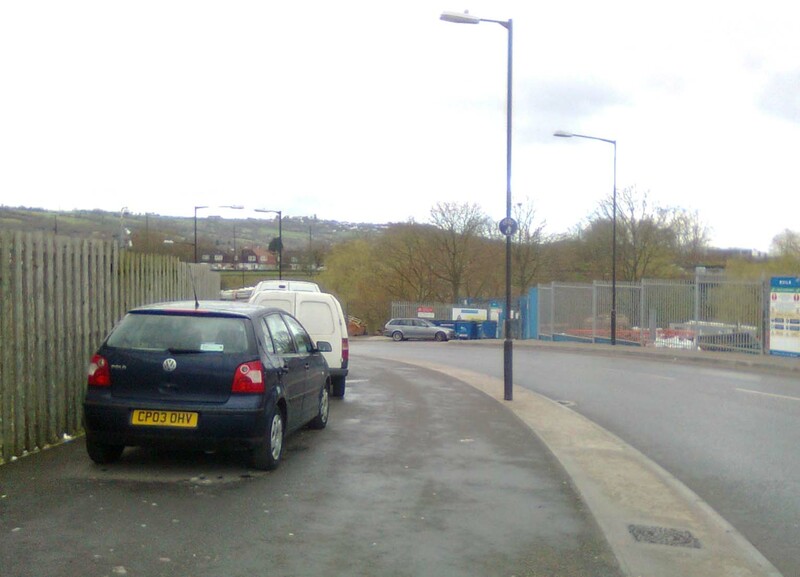 Important: we have heard rumours of changes planned for that road/NHS parking area. Any anonymous documents or emails are welcomed at the usual email address. We like them to remain consistent with our mission statement "be 12-18 months ahead of any breaking news covered by the Evening Post". If we don't get anything in the next few days, we will have to make something up. We've not seen this AA van, EJ08XMD, before. Here it is, on Ashley Road. Or to be precise, Ashley Road's Pavement. As you can see from the cars behind it, the driver could have parked further out, and still not inconvenienced passing cars. Well, probably not. But those AA van wing mirrors, they do stick out, they could brush against someone important driving past: a customer. The people on the pavement -they don't count. The aren't revenue streams. Every person who chooses to not own a car is lost forever. Every household that opts to go from two cars to one: the revenue drops in half. And in today's troubled economy, customers are not things you don't want to lose. That's why when Edmund King gets up on TV to speak up for us, "the motorist", he's really thinking of us "the customer", and our cars, "the revenue stream. We know this because whenever he's on telly, he's going on about outrageous fuel costs, road tax costs. Not once does he ever complain about the excessive cost of Car Insurance in this country, because that's the AA. Similarly, no discussion of how much full AA breakdown cover costs, or whether, given the improved reliability of motor vehicles since the days of British Leyland, whether it makes any sense. You can tell people who grew up in those days as they are the people who phone you when they get to some destination twenty miles away. "I got home", they say, as if we still worry that the Allegro or Mini will not get that far. For that reason, we don't trust anything Edmund King says. The van drivers may be on our side, but management isn't. The van BK58CNV chose a bad day to park on the double yellow lines on the ASL on Bath Buildings, hence the ticket on the windscreen. The road was closed while a 30T load got delivered by HGV, and PCSOs were manning the junctions to make sure nobody tried to turn into the road. With the police by the van for a number of hours, eventually one of them was bound to notice it and ticket it. The video shows this is not a one off event, as taxis drive down our lane, the taxpayers lane, too. If it wasn't for the Mercedes M88RKW parking there, this lane would be completely wasted. Central government have recently provided enough funding for the WoEP to look at some ongoing work, such as the BRT to Ashton Gate and the A38 to A370 road. But not to what the city really needs: buses on the railway path. Because three years ago this month, the Campaign to Save the Railway path was founded. We sent our van over there to see what was lost. Look at it. On a weekday morning, people are cycling along without helmets or hi viz. The one person who is has a yellow top on has one that says "police", but even they said "hello" to us as they went past, instead of the usual greeting "are you the driver of this van, sir?" We filmed the path for a few minutes, and noted nothing happening at all. One or two people trickling down. At one person every 20 seconds, that's three people a minute, 45 people every fifteen minutes. Which, co-incidentally is the number of people a 60 seater BRT bus would have if running at 75% capacity on the fifteen minute schedule originally planned. You could say, therefore, that these people cycling and walking here the same traffic capacity as the BRT system. But look at them. They are not important people, -they are people that live in the inner city, not the nice suburbs. They aren't revenue earners, they are people who either through lack of money or willingness have chosen to not live in a nice pleasant suburbs where pedestrians walking are something to complain to the council about. Now 45 two wheeled bicycles every 15 minutes, that's 90 wheels, in an hour 360 wheels. But four buses an hour, what's that, 4x4=16 wheels? Newts would have been exposed to far less risk if this had been made a bus route. These people who use this path, they talk about the environment and nature, but do they care about the wellbeing of the newts and the WoEP's plans to save them? We think not. Only South Gloucester and North Somerset do, by doing their best to discourage walking and cycling in their parts of the ex-Avon county. But even there, we hear of opposition. Are Car Solutions Ltd sponsoring a bike lane? just east of the M32, Car Solutions Ltd specialise in "injury claims and replacement vehicles"
Custom must be slow this week, as someone appears forced to park their 4x4 FY07BOU in the bicycle only contraflow and pavement in the hope that a collision with a passing car or pedestrian may result in a good claim or two. But without insurance, what good is that? This is why we demand that all pedestrians that walk on the pavements our road tax funds to have registration numbers and third party insurance. And that the police roll out ANPR cameras to detect pedestrians whose insurance has expired. Those people wondering where pedestrians would keep their registration numbers are missing another part of the plan: the compulsory helmets. Youtube recommends this video to us, of a cyclist being passed by a car that proceeds to stop to pick up their friend waiting by the roadside. Even though the future passenger was waiting right at the corner, the driver did pass the cyclist rather than swerve straight in. This forced the driver to drive longer, and the pedestrian to walk a bit. Such selfless acts are not acknowledged by the cyclist. The car did actually indicate when turning in, and all its brake lights were working. By pulling in to the bike lane rather than waiting behind the cyclist, the three cars behind were not held up. Despite the abuse the Bristol Cyclista lays on the tax payer, he is gracious and polite. Marlborough Hill is 25% gradient zero visibility at the bottom. When the council was asking for places to put in contraflows for bicycles, this was one where even the tax dodgers consensus was "no, too dangerous" -though as they have ninetree hill as their secret cut-through, they have less need of it than us motorists. Usually. This rider is brave, and descends at a speed where there would be no opportunity to steer out out the way or stop were something big to come out of a side road. You can see it in the video -and hear it to; the sound of hign-end knobbly tyres on wet tarmac. tyres which offer less surface area on tarmac that slick tyres, and hence can sustain less braking force in the wet. Mud, they work, but on road, not so useful. We've covered the rules for aggressive downhill work before: runout, align, commit! This MTBer is aligned, and 100% committed, but the runout looks dubious. All it takes is a vehicle to pull out from the upper of the two road, the one he turned into, and it's game over. We are shocked and appalled that militant eco-activists would attack our petrol stations and deny us our right to keep the government afloat. And Shell make record profits -as is their right. We do not know who these people are-they claim to be "Bristol and Bath Rising Tide"
We condemn them utterly. One of our 4x4s was help up for 15 minutes. That said, they did appear to make Muller Road more cheerful than it normally is. And while none of them appear to be wearing helmets, many are at least wearing hi-viz, -unlike the troublemakers in South Gloucestershire. YA55VDY is a cult van to us. Never seen to park legally, instead encountered driving up onto pavements, sounding its horn at pedestrians to get out of the way. A delivery van's delivery van. That's right. The famous van, parked kerbside, on a road with no yellow markings. No wheels on the pavement. This is a shocking site, and makes us question the entire delivery model of Medina dairies "avoid refrigeration by driving fast and parking close to the shops". When given a choice between parking legally in a gap four times the length of your vehicle or double parking, go for the easiest option. We don't like Buses here at Bristol Traffic. They drive slowly. They stop us driving in bus lanes. They are full of students and people who have some kind of misguided notion that taking public transport saves the environment, though since none of them have proper jobs First's pricing policy ensures that very few of them can afford to get on the buses nowadays. We do, however, like bus stops, which are a great place to park. 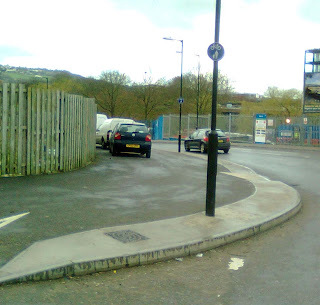 There used to be one here, at the conjunction of White Hart Steps, World's End Lane and Bellevue Crescent in Cliftonwood, but as you can see from the photo below, this is no more. However, the eagle-eyed amongst you will notice that something is pinned to the lamp-post, which upon closer inspection turns out to be an application to reinstate the bus-stop. We urge you to write to the council and support this. Hard to steer with a phone in your hand. A lot of cyclists complain about cars passing them too closely on narrow roads, how they get in our way (technical term "the primary position") to stop the vehicle behind doing this. The problem with this approach is that it assumes that the road is wide enough for oncoming vehicles to get past, an assumption invalid for most of the best rat-runs in the city. Here our secretly-filmed cyclist causes delays for a driver who is not only paying road tax and fuel tax, they are paying VAT on the telephone call, plus of course the telcos paid lots of money for the 3G networks that modern smart phones like the iPhone seen here needs. Sadly, by driving one handed without proper driving gloves, the driver cannot navigate the gap between the parked cars without potentially clipping the wing mirror. If the bicycle had correctly deferred to the more important driver, this would not have been an issue. Instead she is forced to back off, here on effingham road, though this doesn't appear to interrupt the conversation, except she may have been swearing more than normal in the call. People complaining about drivers making and taking calls on the road do not realise that we are forced to do it because of the congestion. If the council re-instated the lost inner city motorway plans of the 1970s, we wouldn't be stuck in traffic, we wouldn't need to phone or text. It is not our fault. Number 2 in an occasional series of pictures of Porsches with personalised numberplates parking outside supermarkets. Once again, there is nobody else parked in the vicinity, and we can only assume that this is out of respect for the Porsche's paintwork. Our previous example was outside Waitrose (naturally) on the Triangle, but here we see T5OOC has parked outside TESCO in Clifton village - they obviously didn't realise that Waitrose is only 2 minutes drive away. It's good to see them following the advice given in the Porsche owner's handbook of not parking too close to the kerb to avoid scuffing the tyres. We will ensure that procedures and attitudes are in place to deliver an incident free working environment for our employees and those who come into contact with our operations. We will endeavour to minimise the impact we have on the environment by use of sustainable material and processes. Well, parking this far in ensures no driver-side wing mirrors will get clipped, so they pull that off, though the risk that a cyclist or push chair may try to get past on the other side -5 or 10 cm further in would have sorted that out. As mentioned before, we are conducting an experiment to make sure that this area remains van friendly. "Trust, but verify", as they say. South Gloucester Council have denied responsibility for enforcing the double yellow lines on this, so we checked to make sure that Filton police are on message, that they know the war on motorists has been lost. I think we can conclude from the fact that the Filton police hotline has an answering machine at the end of it that yes, some government changes have made their way to that part of the system. We have won the war! Nobody will stand in our way! 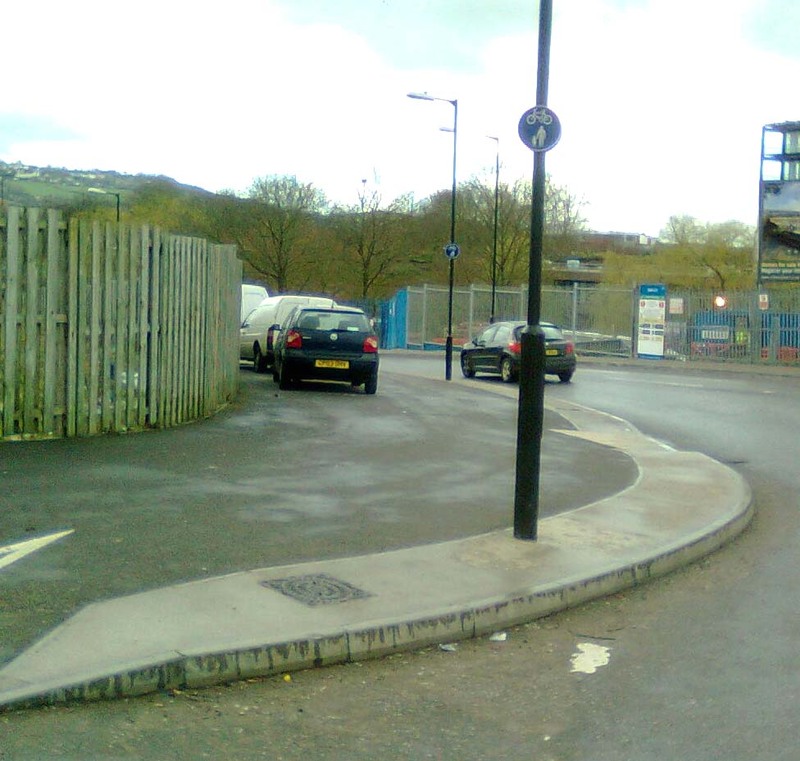 Are Cliftonwood's drivers the most considerate in the city? See how X868MDS has pulled right up onto the pavement so that other cars can get along Ambra Vale East, inconveniencing nobody but himself - he's so close to the wall he can barely get his door open! Some may think that leaving threatening notes for other drivers who don't park so well is just a little militant, but here at Bristol Traffic we are appalled by parking as bad as the example shown by Y453TNV. Look how far from the wall the front of the car is. We have standards to uphold. Good to see that there are still some parking places hiding away in Kingsdown, like on Fremantle Square. Although there are double yellow lines on each of the corners with Thomas Street, if you park your car right in the middle of the bollarded route, as BF02FVK has done, you aren't on any. It appears to be legal to park here. Why the bollards? Its a cycling city route, see. Incidentally, for anyone who thinks that Kingsdown is now upmarket, what with the residents parking, we disagree. The Cotham Porter Stores pub is its very own bit of darkest Somerset, while Thomas Street boasts its very own Banksy. Here it is, framed. Opposite, on a side of road that will soon apparently get yellow lines, that other sign of city life: someone has broken the window to steal something. Question is, was it the classic -satnav- or was it one of the new resident permits? King Street. Lost to cars, full of bike racks. Nearly no traffic. Yet what do we see this afternoon but someone cycling along the pavement. They can't use the "I'm scared of the traffic" gambit here, which leaves just one other: they don't like cycling on cobblestones. There'll be no entrance form for the Paris-Roubaix race arriving in their postbox this year, we suspect. Criminal Attacks on the Abbeywood Bollards!